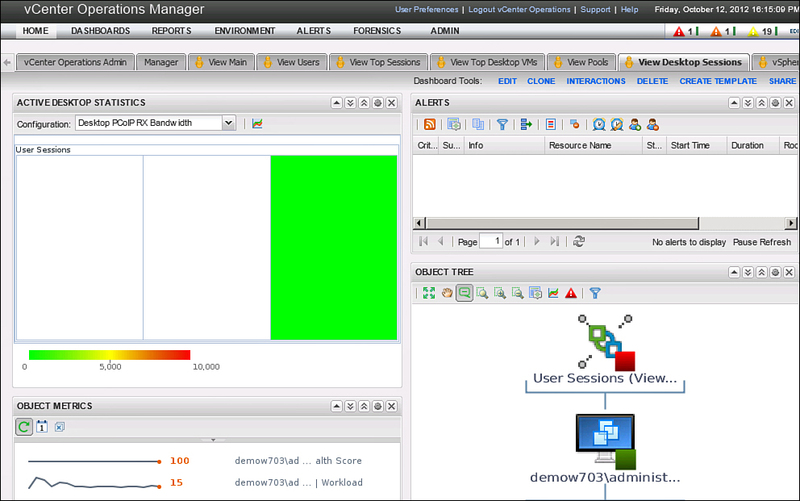 The next dashboard, View Users (see Figure 32), gives detailed information on specific user sessions, such as the current active sessions. You can use it for troubleshooting specific end-user problems such as connection drops and poor performance. 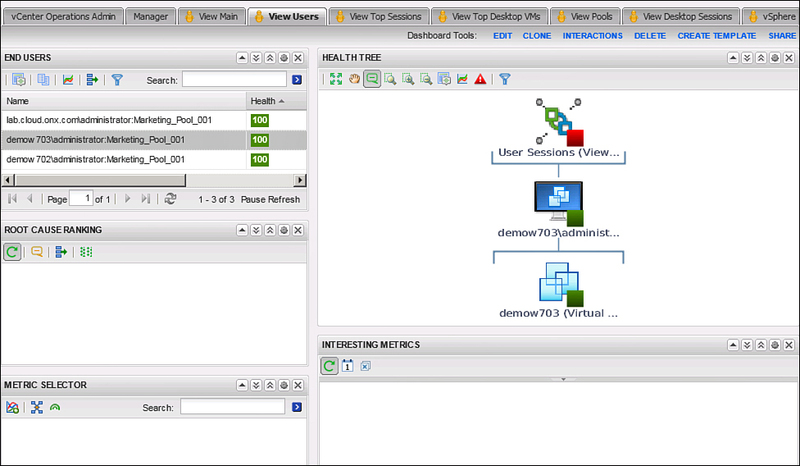 The next dashboard, View Top Sessions (see Figure 33), provides information on the top View Sessions and includes pool capacity, logon times, and the number of connections in a pool. It ranks the pool information in each of these categories. You can use it to compare performance and configuration or problems at the pool level. Figure 33. Top View Sessions. In addition, similar information is displayed at the desktop level on the Top Desktop VMs. 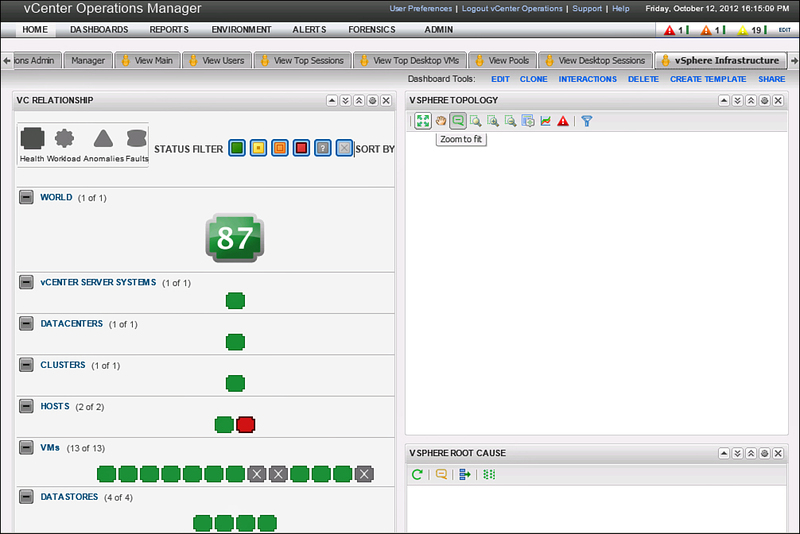 The information in this screen shows more VM performance metrics and critical alerts. It can provide a quick snapshot to help you determine whether any virtual desktops are experiencing performance problems. You also have a View Pools dashboard (see Figure 34), which is a heatmap showing all your virtual desktops. It can quickly show performance issues from the VM to the datastore level. Figure 34. View Pool Performance. In addition, the vSphere Infrastructure dashboard (see Figure 35) provides all the metrics and views previously discussed. With the integration of vCenter Operations and VMware View, you have a comprehensive tool for understanding end-to-end performance and overall health. You have specific information on how key components of the technology are performing, such as PCoIP and the desktop pools. In addition, you can make sure that your environment is optimally configured to ensure you have the highest density without sacrificing performance. Plus, you can plan the scaling out of your environment because you have detailed information on when you are likely to need additional resources in your virtual desktop environment.